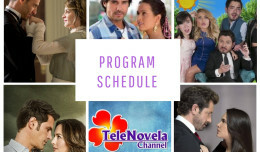 In the Name of Love: Episode 68 | TeleNovela Channel - Bringing you closer to lifes drama. Romina and Aaron still plan to separate Paloma and Emiliano. Camila tries to patch things up with her daughter but to no avail. Meanwhile, Paloma reminisces the times she spent with Macarena. Carlota tells her that it’s time to go back to school and that life must go on. On the other hand, while happily checking the interests in her bank account, Carlota decides to look for the papers that will incriminate her and turns Macarena’s room upside-down.